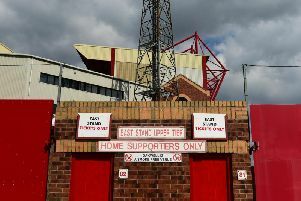 The transfer window is ticking down but, after speculation about his future earlier this month, Fleetwood Town’s Leeds United loan star Lewie Coyle says he is fully focused on life at Highbury. The 22-year-old joined Town on a season-long loan deal from the Championship side in the summer. But, after an injury to Leeds’ first choice right-back, Luke Ayling speculation circled that the defender might be recalled. Leeds have an option to call him back this month but, as the Wednesday transfer deadline approaches, a return to Elland Road does not look likely. And Coyle (pictured) says he is fully focused on Fleetwood as he prepares to spend the second half of the season in League One. He said: “Until I get that phonecall saying I am going back to Leeds I am fully focused on being a Fleetwood Town player. “I’m forever grateful for that. Coyle figured as Town let a one-goal advantage slip to lose 2-1 at Gillingham on Saturday. A last-gasp Tom Eaves penalty sealed the points after striker Wes Burns was ruled to have felled Callum Reilly in the box. Eaves had got the Gills on level terms earlier in the second half after Paddy Madden’s opener. Coyle admitted afterwards that the Town dressing room was distraught by their defeat. He said: “We were thoroughly in control in the first half. “We came into half-time very pleased with how we had performed. “It was opposite to the Blackburn game previously but to lose the game in the way in which we did is bitterly disappointing and leaves a bad feeling in everyone’s stomachs. “Second half they sped up the tempo and we could not really deal with that. He added that Town need to improve their game management as they slipped to 15th in the League One table. He said: “I think Gillingham stepped it up but that is no excuse for our performance levels to drop. “Evidently they did in the second half for one reason or another, we have just got to get better at seeing games out. “We should be looking at getting that second or third goal, kill the game and play smart football.